'Progress always comes late'. Projectionist Alfredo said that of non-combustible film in Cinema Paradiso, but he might well have been talking about 4K home cinema projection. The technology has reluctantly, and expensively, trailed UHD flatscreens. But thanks to a new generation of DLP models, it has finally put on a welcome spurt. New 4K projectors are landing with almost monthly regularity. And they’re becoming increasingly more affordable. Acer's VL7860, featured here, is the most wallet-friendly Ultra HD laser projector yet. 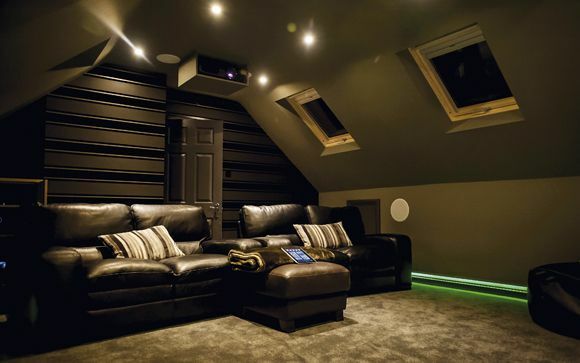 At £3,500, it brings the benefits of solid-state projection tantalisingly within reach for many home cinema enthusiasts – we’ve seen laser projectors before, but at prices ranging from £5,000 for Optoma's UHZ65 to £15,000 for Sony's VPL-VW760ES. So it this Acer the new poster boy for 4K home cinema? One of the key benefits of laser light over a standard lamp is durability. For the VL7860, Acer predicts 20,000 hours use in standard mode, rising to 30,000 hours if run in Eco. You might well think that before 30,000 hours of movie viewing you'd have upgraded to a new-fangled (8K?) projector, but it's reassuring nevertheless. This unit is described as the world’s smallest 4K UHD laser projector, and at this point in time, it probably is. But it’s still big enough to warrant a permanent installation. It looks the part, too. I’m a big fan of Acer’s industrial design; the brand always brings a lifestyle aesthetic to its consumer projectors, and this model is no different. The gloss-white and silver-grey casing screams contemporary techno-chic. The lens is offset, with on-body controls positioned behind the lens assembly; cool running vents run either side. The matching remote control is backlit a bright blue. Setup is manual, rather than motorised, but straightforward. A 1.6x zoom and 1.39-2.22:1 throw ratio (equating to around 100in from 3.5m) should suit most small/mid-sized rooms. A pop-up lens-shift dial allows you to lift the picture upwards of 15 per cent if required. The PJ's feet can also be adjusted to raise its image height. A grid test pattern within the onscreen menus is provided to check focus and linearity. Connections comprise two HDMIs, but only Input 2 is HDMI v2.0/4K capable, which means you'll want to run all your sources through your AVR. There’s also a PC VGA D-Sub in/out, powered USB port for HDMI streaming dongles, plus RS-232, 12V trigger and Ethernet. A minijack audio output is available if the onboard sound system (5W, stereo, best described as 'functional') doesn’t rock your world. The VL7860 isn't crying out for extensive fiddling straight from the box. Acer offers a wide range of viewing modes, most of which work well. But running noise can be an issue – in full flight, the projector hits 30dB, which is quite loud. Opting for Eco reduces fan noise to 26dB. A Silent setting gets you to 24dB. Consequently, while a Movie preset offers the most pleasing visual balance, the Silent mode was the one I most often returned to, purely because it was the most social. Screen brightness falls accordingly, but in a fully dark theatre room this isn’t an issue. Of course, if you can isolate the VL7860, its operating noise will be of less concern. Among the usual picture adjustments is Super Resolution. Switched on, the projector gets an obvious boost to fine detail. Within a test environment, this results in a slight patterning artefact. However, subjectively, it brings a modicum more crispness to real world images. The Acer is bright, but not a light cannon. While it can be used in rooms with some ambient light, its tends to look better in dark conditions. Standard brightness is rated at an impressive 3,000 Lumens, dropping to 2,400 Lumens in Eco mode. The projector delivers 2160p projected resolution using Texas Instruments’ XPR (eXpanded Pixel Resolution) technology. This allows an 8m pixel image to be projected, even though the DMD inside has only 4.15 million mirrors. These switch imperceptibly to increase pixel density. For what it’s worth, I would argue that this is a genuine 4K projector, unlike pixel-shifting models from Epson and JVC, but it’s not directly comparable to Sony’s SXRD native UHD fleet. Under the microscope, test material displays requisite detail. There’s information here that simply isn’t visible on a projector using 1080p panels and pixel-shifting techniques. When it comes to HDR, what we have here is a broad brush approach, adjusting brighter scenes for a high APL (Average Picture Level), or emphasising shadow detail. The upshot is a wide, dynamic presentation. There are variable levels of HDR adjustment offered, although if you edge beyond '2' on the sliding scale you’ll blow out highlight detail. I found the most effective contrast and colour balance was with HDR on setting '1'. And for the cleanest fine detail, devoid of obvious edge enhancement, I’d suggest keeping the PJ's Sharpness setting on a tight leash, no more than '1' on the sliding scale. Overall contrast is good, although don’t expect OLED-style blacks, nor the performance of the pricier Optoma UHZ65. With letterboxed movies, black bars are still projected dark grey. Acer's contrast claim is 1,500,000:1 with Dynamic Black image management (in which lamp power is adjusted dynamically to optimise black levels). As this is a single-chip DLP projector, I was aware of fleeting rainbow fringing, although this was less of an issue watching movies, and more evident when navigating menus. As always, you should get a demo before investing to see if it bothers you. The VL7860 isn't a wide colour projector. It boasts REC.2020 colour compatibility, but that simply means that any wide colour gamut source is downconverted to REC.709. That’s not to imply any massive shortfall in vibrancy, as richly saturated visuals still have sufficient pop. Motion is also handled fairly well. There's a proprietary AcuMotion tech that interpolates frames to reduce blur, for smoother imagery, but it should be said that this doesn’t actually increase subjective motion detail. Away from HDR, this projector can still strut its stuff. I played the Scarlett Johansson cyborg actioner Ghost in the Shell (Sky UHD). With its neon cityscape and cybernetic SFX, the image is a visual feast. As the robot geishas attack, and Johansson breaks through the glass in slow-motion, the detail in the Acer’s image is startling. There’s a real sense of depth as you look deep into the frame (the movie did have a 3D theatrical release, which goes some way to explain the composition). There's no shortage of dynamic contrast from this 4K SDR source either. In fact, there’s so much detail in the futuristic environments, I wanted to freeze the image and explore. The Acer VL7860 is part of the new wave of DLP projection that’s able to push onscreen detail way past what we’ve seen with HD models. It’s compact and cool, and that low-maintenance laser light engine promises a lifetime of consistent colour. It also makes life difficult for its main UHD laser rival, Optoma's UHZ65. It can’t match that model for contrast or HDR brightness, but as it’s around £1,500 cheaper some might think that’s a worthwhile sacrifice. We say: This compact 4K laser projector delivers ultra-sharp images with vibrant colours. It's a tad noisy, and lacks some setup frills, but is still a solid performer for the price.